With our Vendor Management tool, you can keep all your suppliers in one place! Shopventory allows you to connect vendors to your actual inventory, so, combined with our Purchase Orders tool, it’s easy to re-order items. Shopventory will even automatically update your inventory counts when you receive the shipments for your PO, whether everything is there or not. 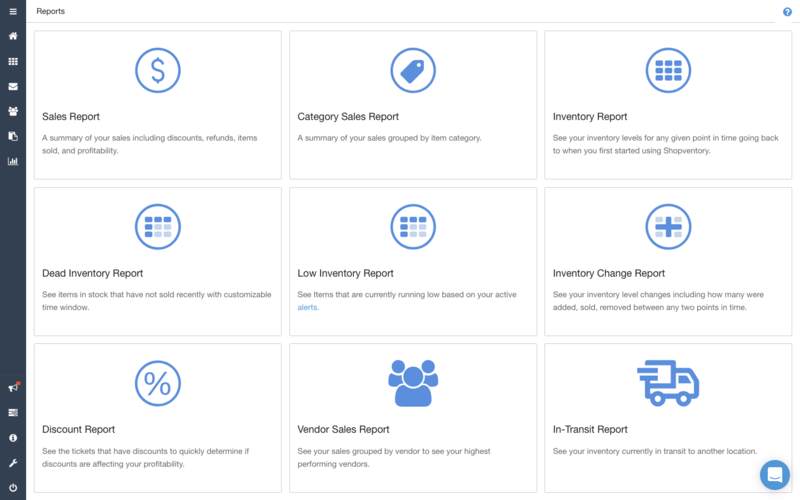 Finally, our robust Reporting tool shows you the pulse of your business in Sales, Inventory, and what’s not selling. Reports are customizable for all your locations, custom time frames, and product categories. You can even see how much you’ve collected in taxes, or how much you’ve been giving customers in Refunds or Discounts. Then, save it as a .pdf or print it off for your permanent records! Business owners using Shopventory save an average of 6 hours per week--we're talking thousands of dollars of savings, every year. We're giving you 30 days FREE to see what Shopventory can do (no credit card required), and if that's not enough, you have 30 more days to see the return on your investment--or you get your money back. 60 days risk-free. It's that simple. To learn more, feel free to browse around our website or help section, or give us a shout with the chat button!